This legendary rune sword is now in the hands of Sir Quixis Ote. 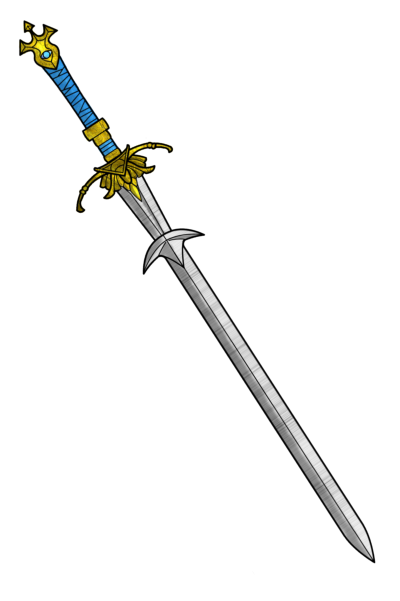 It is held by the palladin voted most worthy by the leadership of the Knights of Dawn. Quixis has held the sword since the retirement from active duty of his mentor, Sir Niklas Thorpe. It has been held by a Knight of Dawn for hundreds of years. +3 strike/parry when weapon is invisible- the wielder can always see it. Quixis can sense weapon up to 4 miles away. IQ 15 Taunts enemy via telepathy if deevil, demon, undead, or minion of dark gods. 20’ range. Double damage to deevil, demon, undead, or minion of dark gods, or any other supernatural evil beings (dragons, etc). Magic- Spells cast at will if sword has enough PPE. PPE 150 regenerates 10PPE/hr. Curse- Separation- If separated from weapon for more than 5 + 1D6 minutes the owner will stop at nothing to get reunited with Lathatatlan. A former owner once tried to face an enemy army platoon of 20 knights single-handed to try and recover the stolen weapon.